Nelson County, Kentucky, which includes the city of Bardstown, suffered more battle deaths per population in the Vietnam War than any other county in America. Bardstown is the home of the Battery C, Second Battalion, 138th Field Artillery, which suffered 50% casualties on Tomahawk Hill and, as a result, was featured in over 100 national media stories. It is also the home of Colonel — now Lieutenant General (Retired) — Harold G. "Hal" Moore, Jr., the hero of the Battle of Ia Drang and co-author, with war journalist Joseph L. Galloway, of the New York Times bestseller, We Were Soldiers Once . . . and Young. Their critically-acclaimed book was adapted into the film We Were Soldiers, starring Mel Gibson and Barry Pepper, in 2002. 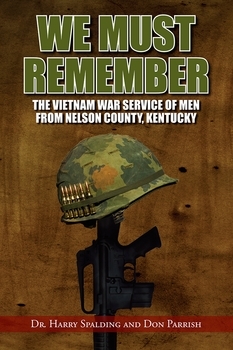 In We Must Remember: The Vietnam War Service of Men from Nelson County, Kentucky, co-authors Harry Spalding and Don Parrish share the service records and stories of many brave Nelson County citizens who served valiantly in all branches of the military during the Vietnam War . . . Many of the men from this one small county in Kentucky were awarded medals and citations for their bravery in Vietnam on patrols, ambushes and sweeps. But all who served will forever be considered heroes in Nelson County.